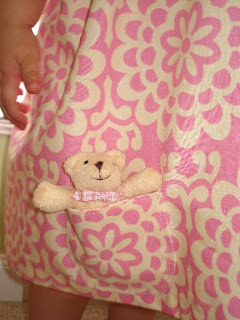 Pockets, or "Pockicks"...as Halle calls them, are Halle's newest obbsession. It's getting so bad that she now refuses to wear clothes that do not have them. I first noticed her interest in storing tiny treasures when Ella was just 8 days old. I had taken the kids to their first play-date in the park since Ella's birth. While there I laid Halle down on a blanket for a diaper change. I was very surprised and shocked when I opened her diaper to reveal a handful of nickels, dimes, and pennies laying in the soiled cloth! Luckily it was only #1! I couldn't help but laugh at what I saw. It was just the beginning of things to come and it wasn't the last time that I got paid to change her diaper! Ha ha! Getting Halle dressed each day is becoming a challenge. The first thing she does is say "Pockicks mommy, Pockicks". Sometimes I will try to put on a skirt or pair of shorts that don't have pockets and try to hand her a purse as a substitute but so far she hasn't bought it! 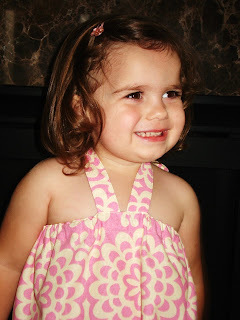 I even made her a sweet little dress last week. When I was finished sewing I brought it to her to show her. The first thing she said was "Pockick mommy". I knew then that there was no way I was going to get that thing on her so back to the sewing room I went (aka the dining room table). I then proceded to cut and sew a pocket onto the dress. When I took it to her the second time around she grinned and graciously allowed me to put it on her! What am I going to do with this girl?! She knows what she wants....that's for sure! Can we say Precious!!! That is an amazing picture of Halle!